T-Rock: A lot of up north rappers inspired me to rap, but first it was my sister. She said to me, one night back when I was like nine or eight, “You should rap!”, out of nowhere and I went from there. I’m easy to be inspired, so it can be the way someone laughs or looks, I might get an idea. Whatever makes me feel motivated. NCT: Do you have “formal” education in music/play an instrument? T-Rock: No, I don’t play any instruments. NCT: How did you grow up with music? T-Rock: My uncle used to babysit me and my siblings and he would always be listening to music, so whatever he was playing I would listen. Be it be Run DMC or LL Cool J.
I was gamed and enjoyed being babysat by him all the time. NCT: Who would you like to collaborate with? T-Rock: Dave East, Nipsey Hussle, Cardi B and Dreezy. NCT: What are your favorite songs of yourself? T-Rock: My mission is to get rich and give back as much as I can. ‘Cause where I’m from, there aren’t as many opportunities as I would like it to be for the youth. NCT: How/why did you start to rap? NCT: Where else would you like to go, musically? T-Rock: I would like to go far as possible to create a whole other genre. I don’t know what it would be called yet, but I can hear the type of music, lol, and be the biggest in the rap industry…. 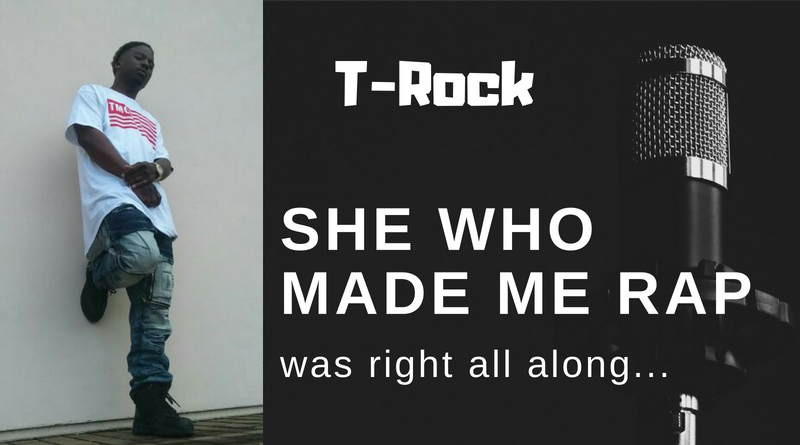 T-Rock on Twitter & Soundcloud! ← Oh sh♥t, T-Rock made me like Trap Music?